A boundary stone buried before the Second World War to prevent enemy troops using it for guidance, has been unearthed in Cornwall. 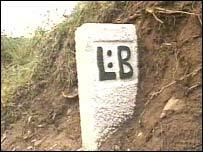 The stone was used to mark the boundary of Lostwithiel and Lanlivery boroughs in Cornwall before it was buried more than 60 years ago. Such marker stones were inscribed with information which it was feared would be helpful to an enemy in unfamiliar territory if the country was invaded. The Lostwithiel stone has now been restored to its original use. The find was made by Cornwall County Council highway worker Ed White while he was checking for potholes down a lane. Ed White said: "I saw a piece of granite sticking out of the ground and local farm owner Graham Tonkin told me his grandfather had buried it before the war." Hundreds more similar stones are thought to be still buried because of a directive by Adolf Hitler in 1940. In Directive 16, he ordered an invasion of mainland Britain. He also ordered his commanders to consider occupying Cornwall as a dry run for the subjugation of Britain. A county council spokesman said: "On the outbreak of war they were considered a liability if Cornwall's largely unguarded coastline was invaded. The simple solution was to bury them." Most remained hidden and were forgotten because, after the war, there were other priorities for the council. Dave Stark of the Old Cornwall Society said: "To an invading soldier, it would have been confirmation as to where he was at that time." He added: "Many were also obliterated. The granite ones had the letters cut our by a mason with a chisel. "These things are a part of our heritage and they do add another interesting dimension when you're out in the countryside." Was WWII mystery a fake?